If you’re in NY, come! I’ll be there with bells on. OK, not really. I’ll probably wear all black like I always do. But you get the picture. The best part of waking up .. The foundation helped the around 8,000 tribals of the valley organise themselves into the Small and Marginal Farmer Mutually-Aided Cooperative Society, with support from the Green Development Foundation of the Netherlands, and assisted them in setting up a coffee processing plant with machinery imported from the UK. The Tribal Cooperative set up by the farmers happens to be the only cooperative in the country to have both fair trade and organic trade certification. One of my favorite places in Delhi is a small shop tucked into Lodhi Colony’s Khanna Market; the man there sells all manner of coffee and tea, including hard-to-find (in the subconty) brews like genmaicha. But even though the proprietor cordially chats as he has someone grind fresh beans just as you like them, the best part of the place hands down is the large framed posters on the wall of what appear to be vintage ads from the Coffee Board of India. The image I’ve posted here is from the Coffee Board’s Web site, but for the life of me I can’t find any other of these gems. Anyone got a hot lead? 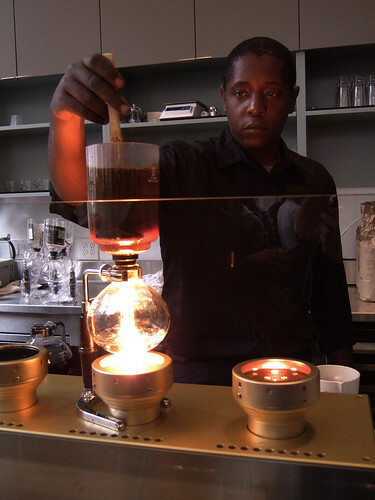 NYT offers a neat piece on the siphon bar, a glorified coffee-brewing machine from Japan that retails for $20,000. I’m happy with my Aeropress (a bargain at $25.95! ), but the artisanal brewing fad is intriguing. One question — just how much does a single cup cost? The Rochester Democrat & Chronicle reports that travelers on the New York Thruway can pick up free coffee or tea from 11 p.m. Monday (New Year’s Eve!) to 7 a.m. Tuesday (Welcome, 2008!) at any of the thruway’s 27 travel plazas. While I applaud the effort to keep drivers safe, a steaming cuppa is no panacea for drunk drivers — no, not everyone chooses to imbibe on NYE, and many designate someone to safely steer them home, but it’s an issue. A big issue. If you’re going to drink, take public transport. Eat something, then wait a few hours before you pick up the keys. If you’re still soaking in gin, stay the night at your host’s place. Just, uh, be safe ya’ll.